Cataract is a common condition among the elderly where the normal clear lens in the eye becomes cloudy or nearly opaque. Eye Screening enables the detection of eye ailments such as Glaucoma, Diabetic Retinopathy, Macular Degeneration and Myopia. Early intervention always results in better outcomes. In some cases, early intervention is crucial before the condition becomes irreversible. A patient being taught vision rehabilitation techniques by A/Prof Goh. "…. two in three stroke patients who undergo the therapy are able to regain between 20 and 90 per cent of their sight." The Straits Times, 10 June 2006. At Dr GOH EYE, the setup is based on a simple philosophy of providing premium eye-care for our patients with our hardware and ‘heartware’. The doctor’s experience and surgical skills aided by advanced eye equipment and caring staff help us fulfil our primary mission of bringing good vision to all our patients. Dr GOH EYE offers premium services at affordable prices for cataract surgery, vision rehabilitation, screening and management of diabetic eyes, glaucoma, macular degeneration, dry eyes, red eyes, eye injuries as well as myopia management for children and students. Dr Goh Eye Specialist holds free public forums quarterly to inform the public about the symptoms and treatment of Cataract, Glaucoma, Diabetic Retinopathy, Age-related Macular Degeneration (AMD) and Dry Eyes. Attendees will be taught self-help AMSLER GRID eye-check at each forum. 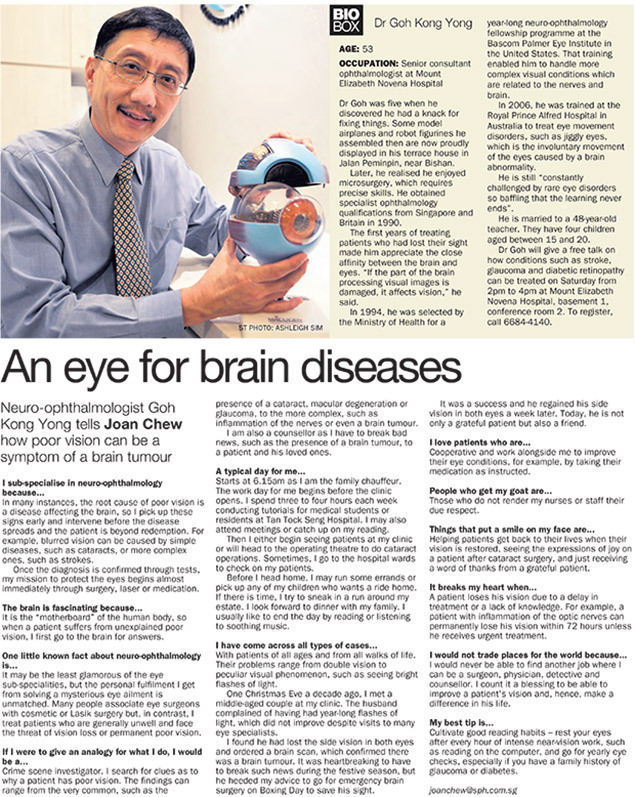 Please call Dr GOH EYE SPECIALIST at Tel: 6684 4140/ or SMS 9644 4830 for enquiries or to register. Also come and find out about the 'gold standard' of cataract surgery and the suitability of various lens implant for your eyes.